I finished last week's Cladonia, but I still need to block it. It turned out so well, I decided to knit another one. I am changing this one a bit. I have more yarn, and I want to make it bigger. 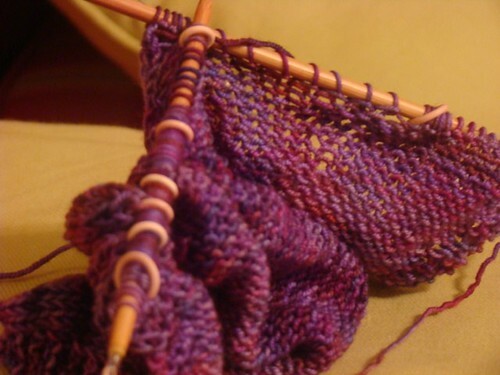 So, I am adding four repeats to the lace pattern. This will be the first time I really change a pattern like this. I've adjusted size before, but nothing with a 'pattern.' I'm excited to try with this. I'm still pretty early in the pattern, since I haven't had much time to knit. Hopefully, I'll be able to show you pictures of both shawls next week. I'm also reading The Kane Chronicles, Book Two: The Throne of Fire . Well, I've started it, anyway. I've only gotten to read a few pages, when I've been able to steal it from Xavier. We love all the Rick Riordan books, but Xavier especially loves the Kane Chronicles, since they focus on the Egyptian gods. Xavier has a passion for the Egyptian gods. 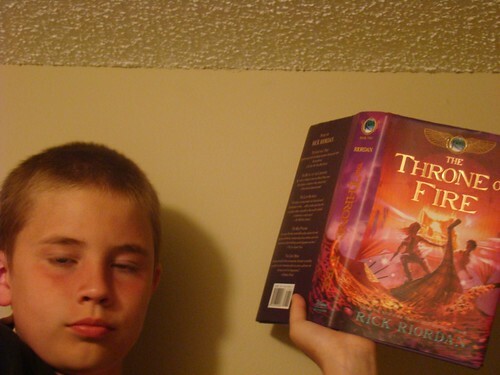 The rest of us just have a passion for Rick Riordan. If you haven't found his books yet, I highly recommend them. Fortunately, he's a prolific writer, and we get a new book about twice a year.